Empress Elisabeth of Austria was one of the most beautiful women in history and a powerful monarch. Her stunning beauty won her the heart of Franz Josef, who claimed to fall in love with her as soon as he saw her and married her a mere eight months later. She was known as “the Rose of Bavaria,” and on her wedding invitations was a rose that, when opened, revealed her portrait. As time went on, she was unable to adjust to life in the Austrian court among the powerful Hapsburg family, particularly her domineering mother-in-law, Archduchess Sophie. Her adult life came to be defined by tragedy, depression, and fruitless attempts to recreate her carefree childhood in Bavaria. Her mother-in-law took her children from her and raised them away from her, not even allowing her to nurse them as infants. She lost her oldest daughter from typhus when she was only two years old. Three decades later, her only son and the heir apparent to the throne committed suicide. Meanwhile, she had become so preoccupied with her appearance and enhancing her natural beauty, possibly because it was the only thing in her life that she could control. She underwent extreme fasts that might today be considered symptoms of anorexia nervosa. She also would binge on food and may have purged afterward, symptomatic of bulimia. Much of her time as Empress of Austria was spent away from the royal court, so much so that sometimes, she only remained in Austria for a few weeks out of the year. 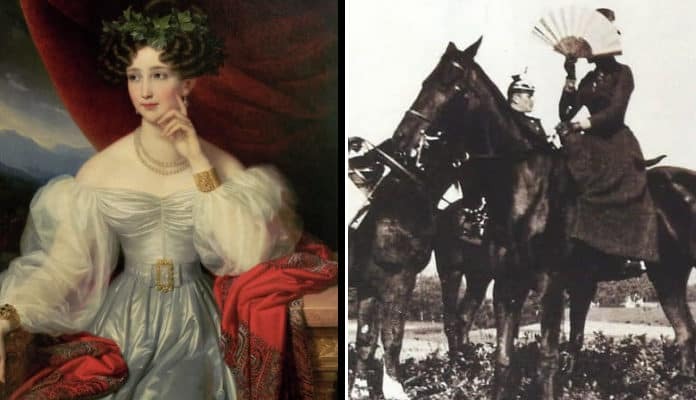 She wanted the carefree life of her youth when she could ride horseback throughout the Bavarian countryside rather than be stifled by the rigid lifestyle of the Hapsburg court. Nevertheless, her life was celebrated by her people. She worked out policies that championed and benefited them, sometimes at the expense of the Hapsburg court. She earned enemies in the court by promoting populist policies in Hungary; she was rewarded by being crowned Queen of Hungary after she united the once-bitter rivals of Hungary and Austria in the Austro-Hungarian Empire. Ironically, she was assassinated by an anarchist. Today, her legacy is being revisited as people want to learn more about this eccentric, tragic figure. Keep reading to learn more about the iconic Empress of Austria and Queen of Hungary, and the indelible mark that she left on history. Coronation photograph of the Empress Elisabeth. Emil Rabending – Extract of image: Erzsebet kiralyne photo 1867/ Wikimedia Commons/ Public Domain.